In 1976, when Ronald Reagan lost his second bid for the GOP presidential nomination, it looked like his political career was over. Yet a year later, at the Conservative Political Action Conference, Reagan introduced us to a "New Republican Party"-one that looked beyond the country club and corporate boardroom base to embrace regular, working-class Americans. Reagan's movement quickly spread, leading to his landslide presidential victory in 1980. Craig Shirley charts Reagan's astonishing rise, his personal evolution from angry anticommunist into a more reflective and hopeful leader, and his transformation of American conservatism. It is a compelling account of the outsized figure behind the Republican party's most radical reinvention. 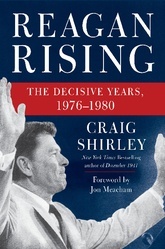 Craig Shirley is the author of Rendezvous with Destiny, Reagan's Revolution, and the New York Times bestseller December 1941. Widely known as a leading presidential historian, he is also the Visiting Reagan Scholar at Eureka College, Reagan's alma mater, and lectures often at the Reagan Library and the Reagan Ranch.